Tranquil Paws, Victoria and T-Touch made such an amazing positive mark on my Cats and my overall household. Started with 3 cats (2 males, 1 Female; Cooper, Amos & Shilo). Amos, didn’t like being held or sitting on laps, and antagonized the other cats. Shilo, afraid of the other two, very shy and insecure and didn’t like being held or sitting on laps. Cooper, a sweet lovable lap cat that is adored by the whole neighborhood. Then I added Fresco, a significantly injured, rescued, cage crazy and pissed off male cat to the mix. I adopted him from my Veterinarian, who had nursed him back to health. She warned me he would be a challenge, but I was willing to give him a good home. Introductions didn’t fare so well, I had to keep Fresco separated from the other 2 males as there would be bloody fights. I did what I called “changing of the guard”. While 2 cats (Amos & Cooper) were outside, the other 2 (Fresco & Shilo, who got along) were in the house, partway thru the day, I switched the cats, as all fare much better with outdoor time. Evenings they would all be in the house but 2 were kept in the bedroom with closed door. Over time, the Vet would apologize for letting me take Fresco, as he continued to be a cranky cat. Then, I found Victoria (Tranquil Paws) and she introduced me and the cats to T-Touch, Thunder Shirts and her wealth of knowledge. Victoria and her techniques did wonders on my clowder of cats. It took a while, as I was dealing with 4 very different personalities, but we’ve had “Great” success. Amos loves to be held, sits on my lap and is no longer antagonistic. Shilo loves to sit on my lap, be held, is more secure, confident and happy. Fresco has lived up to his name, he is now a cuddling purring calm cat who loves to talk. And most importantly, I no-longer have to keep them all separated. All 4 cats sit in the living room at the same time with no issues and be left to roam the house all night long too. I also can trim their claws with minimum effort now. We are a true believers of Victoria, T-Touch Techniques! They saved our household!! We are one happy family now!!! And the Vet can’t believe the transformation of Fresco into a sweet loving cat. I tell everyone I come across how Tranquil Paws and her techniques work wonders. Victoria is one referral I have no problem giving!!!!! I adopted Dickens, the Parson Russell Terrier, when he was five months old. Dickens was cute, playful, energetic, unfocused, and easily aroused by almost everything. I was embarrassed to take him places. At his first basic obedience class, Dickens stayed behind an x-pen draped with sheets to limit his view of other dogs. We gained very little. At his second obedience class, the dogs were separated by shopping aisles. Dickens picked up a few skills, but he was still overly distracted by everything in the environment. Then, we attended a TTouch workshop with Victoria. We wrapped Dickens in a thundershirt and did body work on his feet and tail. I continued this work at home and before long, I was able to touch his feet and tail without being snapped at. We registered for Victoria's obedience class. Victoria's training methods are gentle and humane. Dickens wore his thundershirt. He began to calm down and focus. His sits and downs became more reliable. He started to pay attention to me while walking on his leash. By the end of six weeks, I could see definite improvements in Dickens' behavior. The TTouch work with Dickens was a major turning point in his life. Dickens is now two years old. I train Dickens a little bit every day. His attention and self-control skills continue to improve. He lives peacefully with our two cats and older dog. He appreciates having his fur brushed and his muddy paws wiped clean. He sits quietly inside a crate when he rides in the car. Dickens has become a sweet, cooperative little terrier. I am grateful to Victoria for sharing TTouch with us. "I learned of the T-Touch program through the Ameri-Can Stabyhoun Association. I am on the board of the ASA and T-Touch was discussed at a board meeting. I have a female Staby named Chelsea who developed some fears when she was a puppy mostly because she didn't get properly socialized. It was very beneficial for both Chelsea, and my wife and I, for Chelsea to go through the basic T-Touch program. By the third visit Chelsea was excited each time we arrived at Victoria's house. We learned some good techniques and lessons from Victoria about how keep Chelsea calm and less fearful. We also learned some good techniques for training her using a clicker, using the command "Watch Me", and using a Thundershirt. We'd recommend Victoria working with your dog should some behavior changes are needed." "After training, I saw my dog become much calmer and listen to commands. I learned how to work with him so I could have the dog I wanted -- a mild mannered, quiet and well-behaved dog who broke the stereotype of Chihuahuas." "Getting my cat Boo into a crate was an impossible task. Boo is terrified and uses every fiber of his being to hide or break away from us. We asked my mom, Victoria, to come over on moving day to help us get Boo into a crate. My husband, Jeremy, thought it would be impossible. He couldn't believe his eyes when after only a few minutes of working with him, Victoria got Boo to go calmly into the crate ON HIS OWN. Jeremy is a true believer in the TTouch method after observing that miracle." "Victoria is an excellent teacher. While she became acquainted with my dog, Yoli, we discussed what issues I wanted to work on. Victoria taught me seven Ttouches. She demonstrated the basic touches on my arm and invited me to practice on her arm. She taught me how much pressure to apply. Victoria did all of the touches on Yoli, and Yoli asked for more. Victoria's instructions were clear. The information was well organized and presented at a comfortable pace. Then we moved outside. Victoria set up a labyrinth in my front yard. Despite Yoli's training with loose leash walking, the labyrinth was a new challenge. Yoli would not budge for me, so Victoria walked Yoli through it the first time. I walked Yoli through the labyrinth the second and third times. It was fascinating to watch Yoli process information. She was exhausted all evening. Since our lesson, I have done bodywork on Yoli every evening while I watch the news. Yoli is walking better on our hard wood floors. Her pace is quicker and she seems more confident. She also seems calmer than usual." "My cat Squeekers was a little pill when it came to having her nails trimmed. It took 2 vet techs to hold her down and one operate the trimmers. After Victoria worked with her, not only could I trim her nails myself, but she now purrs during the event. She now, believe it or not, purrs when visiting the vet too!!! I am a believer in how much TTouch can help after witnessing the transformation of a cat who I thought would be impossible to change." 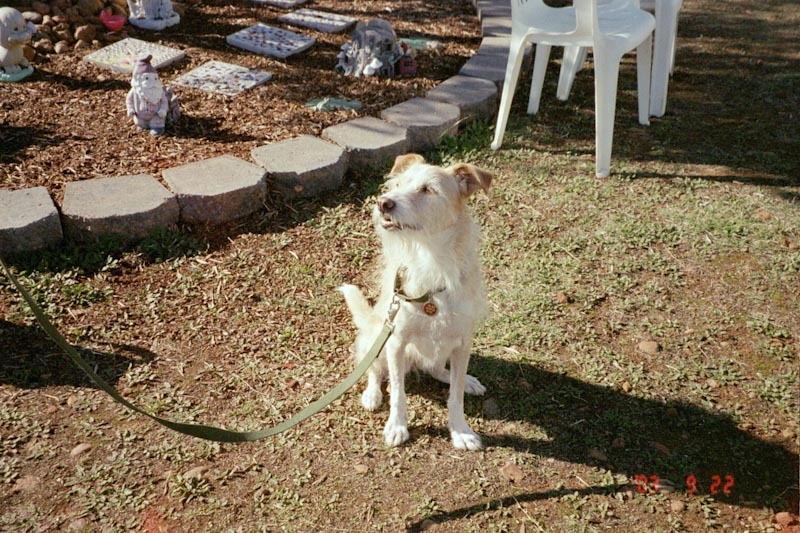 "TTouch has been a tremendous help to our dog Shubert. The retraining process that Victoria and her dogs have taken him through has resulted in astonishing change. Shubert's aggression and agitation with other dogs around, has greatly diminished with the TTouch therapy. Additionally, Victoria's calm and gentle, yet strong manner, allowed Shubert to trust her immediately. We were very pleased with Victoria, her team of training dogs, and TTouch." "My dog Bailey, who is a 11 year old white shepherd, started limping. Her function was significantly reduced and she didn't venture off her bed very often. I tried various nutritional supplements and even did some chiropractic adjustments on her. The turning point for Bailey was the TTouch therapy that Victoria did on her. Victoria is very compassionate and her work helped Bailey become active again. I would definately recommend the TTouch therapy to others." My cat Bella loved being the "demo cat" at Victoria's workshop. I adopted her in 2011, and she has blossomed, but she has been a compulsive groomer. With the addition of the TTouch® techniques we learned from Victoria, she is much calmer and hasn't found the need for constant grooming. This has helped so much with her hairball and digestive issues. Victoria has a very gentle manner, and Bella settled down right away and loved being part of the workshop. I would highly recommend Victoria and this technique for any health and behavior issues. Victoria... Thank you so much for all your help with our dog, Molly. I appreciate all your advice. She runs free on the farm now and does not come close to our chickens or the neighbours multitude of feathered friends either. We have one more thing to work on with her...just left it till last. Thank you again! You are an amazing blessing to so many people.